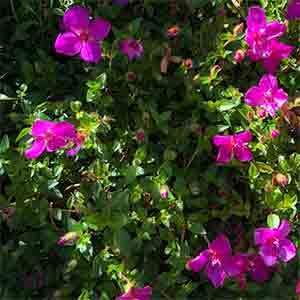 A low growing free flowering ground cover plant, Heterocentron elegans is commonly called Spanish Shawl. When in full flower it is bright and cheerful, and it grows well in sunny positions protected from frosts. It adds colour, helps prevent weeds and although it will spread is easy to maintain and confine. Being evergreen and long flowering, this is a plant that will spread over rocks as well as cascade over the edge of a retaining wall. It is native to Central America, however it grows well on cool to temperate climates as well. Best grown in a humus rich free dining soil. In warmer climates some pectin from the heat of the afternoon sun will be beneficial and a little extra water during long dry summers will help promote good growth. When planting, weed the area well and digging some well rotted compost. Plant Spanish shawl and water in with a liquid seaweed fertiliser. Water through the first summer. Fertilise with a general purpose slow release fertiliser in spring. No pruning is required and maintenance is negligible. Simply remove any runners that are not required. Spread – will cover a meter (3 ft) or more. Foliage – Evergreen mid to deep green. Flowering time – Spring right through summer. Drought tolerant – Low to medium depending on the amount of sun.